Google Showcase Ads display results for commercial searches above AdWords ads, creating a unique opportunity to get your product into your customer’s shopping cart. Intrigued? Here’s the lowdown on how to build and optimize Showcase Ads. What are Google Showcase Ads and how do they work? A Google Showcase Ad (GSA) is a shopping ad containing several related products that appear above paid Google AdWords search results. 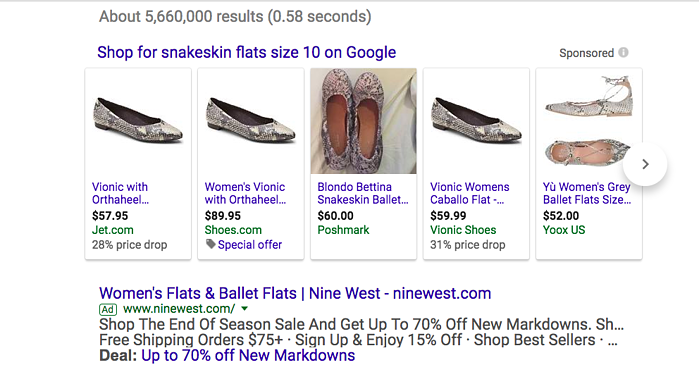 Initially, these ads would pop up only when searching a broad, general category (such as “snakeskin flats”), but after running some additional searches I was pleased to discover that they can now be very specific… and crushed to find out that I will never be able to replace my size 10, black tipped, pointed toe Franco Sarto snakeskin flats. Thanks, Google. See! Google Shopping Results Appear ABOVE Paid Ads. The great thing about GSAs is that the first impression is free. Your account will only be charged if the customers expand and stay in your ad for 10 seconds or click through to your site. This function has a lot of potential to reduce your Google Adwords spending and increase marketing ROI by allowing customers to comparison-shop inside their initial search results. If pricing is competitive and your ad optimized, GSAs can be a game changer for merchants. On the other hand, if you fail to create and optimize your GSAs, you’ve essentially handed your competition that coveted first impression, even if you have the bigger AdWords budget spend. Google Shopping Ads display everything from large retailers to second-hand sellers, like Poshmark. This makes setting up and optimizing GSAs a top priority for anyone selling merchandise. In order to take advantage of your GSA, you’ll have to jump through a few goops (Google hoops, which I swear is a thing! ), and who better to teach you how to do that than Google itself? Before you do anything, be sure to review the requirements to set up a GSA campaign. You can then learn all about Google Shopping Ads in the AdWords Help Center "About Shopping Campaigns" section, and get instructions on how to set them up in the "Create a Showcase Shopping" section. By mapping your campaigns to conversion data with closed-loop reporting, you can show the forces that the extra investment and new budget allocation is worth it in the long run. Showcase ads do not work with automated bid strategies, so you’ll have to either change your current campaigns to maximum CPE bidding, or set up a separate campaign. As mentioned before, the initial view of the GSA is free, and you will only pay when someone expands your ad for more than 10 seconds or clicks the link, so make sure that they can immediately glean the information they need from your ad. You can only use one ad per ad group, so plan accordingly. Adding extra ones will be a waste of time and effort. GSA’s visual nature caters to the primal parts of our brain, but also makes it harder to stand out from the crowd. Have a look at the other photos in your category. Is there a way that you can make your product photo stand out? Adding a colorful background or using a model instead of a plain product shot (or vice versa) may help catch the buyer’s eye. You’ll also want to make sure that your ad has enough contrast, as it is easy to scroll past ads when they are all lined up in a row. The third image almost disappears due to poor contrast. When setting up the ad Google will ask you if you want to use a product image or a cropped header image for the collapsed ad. If you are advertising a specific product, then use the product image that best fits the user’s search terms. If, however, you are advertising group of products rather than one specific product, then choose the cropped header image. Since you are no longer bidding on individual keywords, it’s more important than ever to optimize your title by using brand name, style name, size, color, material, and other descriptive elements in the title of the ad. While you can't select keywords that your ad should show in, you can use negative keywords (either at the campaign level or in a specific ad group) to keep your ad from showing in irrelevant places. Depending on what your product is, you may need to do some tracking to see where leads are dead-ending before implementing this tactic. Google loves nothing more than up-to-date and relevant information, and you can increase your rank by allowing Google to fetch the data from your account on a daily basis, rather than the minimum required 30 days. GSAs include promotional details, which can give your buyers an instant incentive to shop with on your site. Special offers appear in Google Shopping Ads without expanding, allowing you to advertise deals for free. Google offers automated extensions that fetch promotions from your website and showcase them in your GSA, alerting your customers to discounts, price drops and free shipping. It also allows you to set up other promotions, such as percentage discounts, BOGO deals and more. The merchant promotions implementation guide will get you started. Google may take up to 72 hours to review your ads to ensure they are compliant. Review their guidelines to make sure everything is in line, and give yourself a time buffer in case you are running any time-sensitive promotions or have a client deadline. Global Trade Item Numbers (GTIN) – including UPCs, EANs, ISBNs, MPNs, etc. – help Google determine the exact brand and item you are selling, allowing them to place your product with greater accuracy. Google prefers these to other attributes, stating they make your ads richer (so we can assume that using them might also end up making us richer). Don’t fret if your product is custom-made and doesn’t have a GTIN, as Google understands that store brands, OEM parts, preorder parts, and vintage items usually don’t have them. Instead of using a GTIN, Google recommends you submit as many attributes as you can. Check out our case study with the fashion watch retailer MVMT, who was able to raise revenue by 108% and double conversions using AdStage's PPC automation software, while also lowering acquisition cost by 18%.